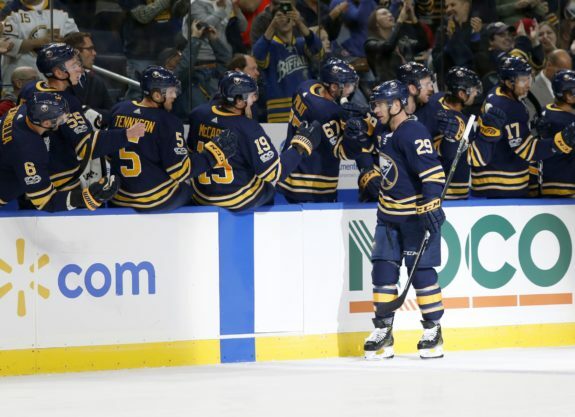 Between the horrendous turnovers and atrocious giveaways, amid the troublesome lack of effort and inept passes, and lost in the avalanche of losses, there are actually a few positives to build on with the Buffalo Sabres. Getting overshadowed by the all of this are the performances of Jack Eichel, Evander Kane, and Jason Pominville. As of Sunday night, all three are in the top ten in league scoring. Each player has eleven points after nine games. Kane has six goals and five assists, Pominville has five goals and six assists, and Eichel has four goals and seven assists. The forwards have been on the same line for the majority of play so far. They’re creating chances and making them count. At this pace, the three players are all on pace for roughly 100 points. Kane is on pace for 55 goals, 46 assists. Eichel is on pace for 36 goals, 64 assists. Pominville has found new life playing with Eichel and Kane. 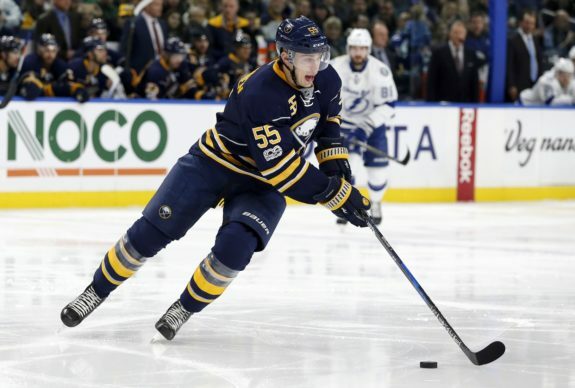 Acquired this summer in a deal that saw him go east with Marco Scandella for Tyler Ennis and Marcus Foligno, moving Pominville’s contract was seen by some as a salary dump. Instead, Sabres rookie coach Phil Housley has been rewarded for having Pominville on the Sabres’ top line. The ‘population’ of Pominville is on pace to challenge his most productive professional season which was in 2007-08 during his first round of duty in Buffalo (27G-57A-80Pts). Eichel has four multi-point games already. The only times that he has been held pointless were against New Jersey and Anaheim. Despite no points and three shots on goal against the Ducks, he was named the game’s first star. Kane also has three multi-point games, while Pominville has two. 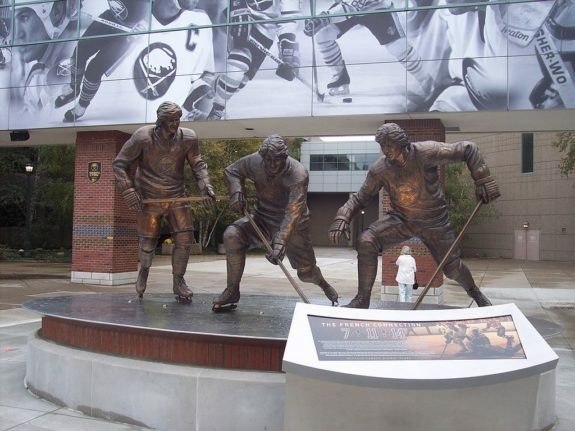 The only time the Sabres have had three players finish in the league’s top ten in scoring was during the 1974-75 season. That year, The French Connection line was magical; Rene Robert was seventh (40 goals, 60 assists), Gilbert Perreault was ninth (39 goals, 57 assists) and Richard Martin was tenth (52 goals, 43 assists). That team eventually lost in the Stanley Cup Final to the Philadelphia Flyers. There were three other seasons in which the Sabres had three players in the top 20 league scorers. In 1992-93 (LaFontaine, Alexander Mogilny, Andreychuck). These teams all made the playoffs yet didn’t advance more than one round. Rasmus Ristolainen confuses most professional hockey critics. Most Buffalo fans don’t understand the nay-sayers. Playing monstrously large minutes against the most skilled competition behind some of the least productive players on a team that has struggled to stay out of the cellar for years, he has thrived. 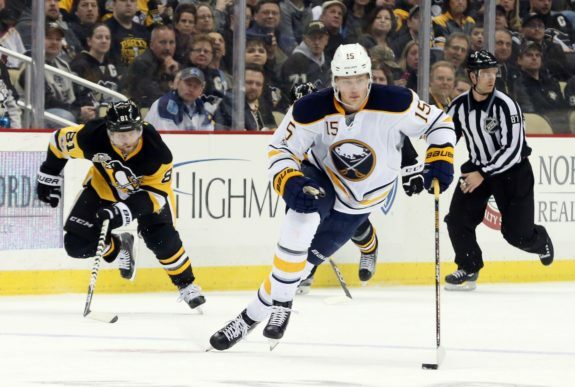 In his first three full years with the Sabres, Ristolainen’s production has gone up from 20 to 41 to 45 points while his plus-minus has gone down from -32 to -21 to -9. Last year, he quarterbacked the league’s best powerplay that executed at a fantastic 24.5% clip. This year, under a rookie coach teaching a new system, Risto is once again anchoring the new defense. The defensive corps will see its eleventh member hit the ice in their next game–five of these players weren’t with the team last year. In the first nine games, he has four points and is a -3 even as the team has a goal differential of -11. He also leads the league in ice time at an eye-popping 27 minutes and 27 seconds per game, 45 seconds more than the next two players (Washington’s John Carlson and St. Louis’ Alex Pietrangelo). This team has a long way to go before it becomes a contender. Often outplayed, outhustled, and outcoached, it currently sits with a record of 2-5-2, near the league’s basement. There’s really only one way to go. Saturday’s come-from-behind, 5-4 overtime win against the Boston Bruins proved they’re capable. For now, let’s take a deep breath and appreciate a few players that are actually pulling their weight.